I'm not just having senior moments, I'm having a senior year! Poor Donald Trump: He was born with a silver foot in his mouth! When did guys start getting haircuts that look like the barber had a seizure . . . and kept on cutting? I keep getting Ivanka and Melania Trump mixed up. One is the First Daughter and the other is the First Arm Candy, but I can't remember which is which. Now that we're in the era of destination weddings, how far off are destination funerals? I don't like action flicks, special-effects movies, sci-fi extravaganzas, costume dramas, outrageously lame sequels or Adam Sandler. In other words, I don't go to the movies. "Mr. Cohen served as rabbit of the synagogue for many years." (Duluth, Minn. Tribune) via "Still More Press Boners," by Earle Tempel. Why do snack foods like potato chips have actual expiration dates on them . . . and food items like crackers and cookies have some indecipherable code? Who makes these decisions? Did Congress pass a Consumer Confusion Act when we weren’t looking? Eightieth Wisconsin Town I Didn't Know Existed Until I Saw It Mentioned in a Green Bay Press-Gazette Obituary: Lark, Wis.. (R.I.P., Ramond C. "Chuck" Schmitt, Green Bay Press-Gazette obituary, Nov. 1, 2017). Previous entries: Athelstane, Walhain, Duck Creek, Breed, Anston, Sobieski, Amberg, Osseo, Angelica, Brazeau, Waukechon, Sugar Camp, Kossuth, Lessor, Kunesh, Pulcifer, Cato, Florence, Greenleaf, Eaton, Poygan, Hofa Park, Hilbert, Hollandtown, Beaufort, Glennie, Harshaw, Bessemer, Crooked Lake, Tigerton, Goodman, Readstown, Dousman, Butternut, Montpelier, Cecil, Red River, Gillet, King, Laona, Kelly Lake, Glenmore, Tonet, Stiles, Morrison, Dunbar, Askeaton, Wild Rose, Neopit, Ellisville, Pickett, Flintville, Forest Junction, Thiry Daems, Black Creek, Mountain, Ledgeview, Lunds, Suring, Lakewood, Beaver, Cloverleaf Lakes, Krakow, Pella, Townsend, Vandenbroek, Coleman, Spruce, Armstrong Creek, Lake Gogebic, North Chase, Navarino, Pequot Lakes, Buchanan, Rio Creek, Humboldt, Mill Center, Carlton and White Potato Lake. As Socrates famously wrote, "The unexamined life is not worth living." One would well posit that the unchallenged life is not worth living. Or, if it is, not as satisfying. Most of my music-related activity since leaving the Air Force Band in late 1969 has been as an author and critic, my playing restricted solely to playing along with records at home. Soloist Jim Szantor as lead alto David Bixler gives the cutoff on the final chord. 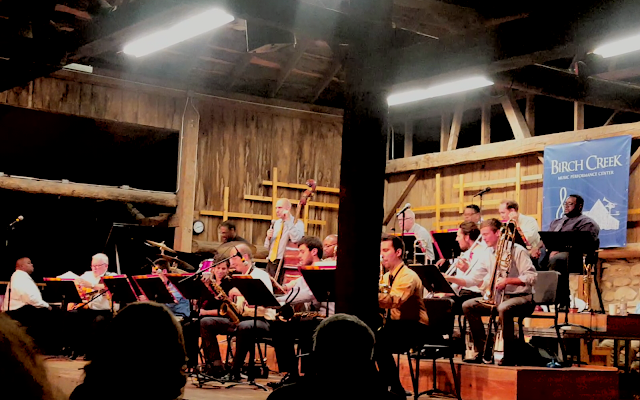 But that changed on Aug. 11 when I performed as a guest soloist on clarinet with the fabled Birch Creek Jazz Orchestra, a big band made up of some of the best jazz players in the country, comprising as they do the faculty that teaches the students who come to Egg Harbor in Door County for two-week sessions of intensive training and performance opportunities. It's sort of a musical boot camp but with kindly but highly decorated instructors. 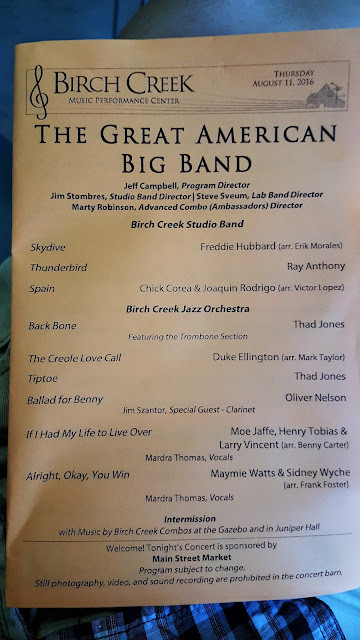 My feature spot was "Ballad for Benny" a tune written by the late, great jazz composer and saxophonist Oliver Nelson, who was commissioned by Benny Goodman to write new material for the band's historic 1962 tour of the Soviet Union. It was such a significant cultural/political event back then that Walter Cronkite often led the CBS Nightly News with the band's latest exploits. The 17-piece Birch Creek Jazz Orchestra prior to my introduction. This tune was recorded by the Oliver Nelson Orchestra (with the great Phil Woods in a rare outing on clarinet instead of his usual lustrous alto sax) but never performed publicly in this country--till now. 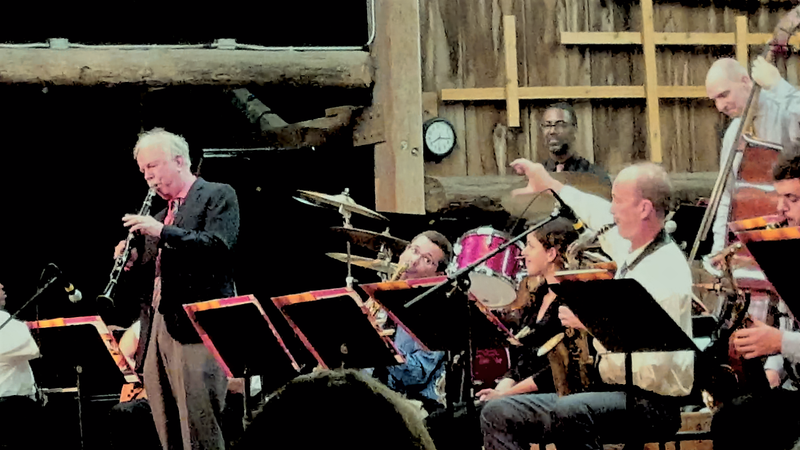 If you do an internet search on some of the illustrious players in the band behind me --Dennis Mackrel, Clay Jenkins, Doug Stone, David Bixler, Tanya Darby, to name a few--you'll see why I'm so proud to have been selected to perform with them. Part of the evening's program. It was an oppressively muggy night (close to 100 percent humidity) in the un-air-conditioned hall, making intonation more of a challenge than usual. It took some months of chipping away at the rust that had accumulated over the years on my woodwind chops, but I was determined to have one last dance, so to speak, with the idiom that I have loved for a lifetime. To paraphrase the late Karl Wallenda of the famed aerial troupe The Flying Wallendas, "Life is the bandstand. The rest is just waiting." Luckily for me, the wait is over. It has been a long and winding road that brings the Class of '61 to Reunion Weekend. A time when we can take our noses out of our devices and communicate the best possible way--face to face. We've come so far and seen so much, but on this occasion it's all about something that we can never get enough of--living in the moment with people who matter to us. Some of us may say more to each other this weekend than we did when we were in the same building on a daily basis. Reunions can be strange that way. We've gone our separate ways in many ways, but there are bonds that can never be separated, and Mary D. Bradford was a big part of that. Some of the connections we treasure started before that, some came after. But we're so fortunate to have them. There's no app for that. Our birth dates and graduation dates were bookended by two presidents known mainly by their initials (FDR and JFK), with some of us then sent off to an unpopular war by LBJ. (OMG!) Somehow we survived anti-war and race riots, three high-profile assassinations and thought we were living in turbulent times then. Little did we know. We've reached the time of our lives when, as is often said, it seems as if we're having breakfast every 20 minutes and a doctor's appointment every 20 days. And if our waistlines have expanded, so have our vocabularies. Unfortunately, many of our new words end in "itis," "oscopy" or "ectomy" (with a few "ograms" thrown in for good measure.) Some of us are lucky enough to have original factory equipment, but others seem to be doing just fine with replacement parts. Our mileage may vary accordingly. Our lives since high school have had similar arcs (higher education, marriage and careers, exhilarating highs and devastating lows, medical battles won and lost), but no two narratives are alike, with their surprising and fortuitous twists, unexpected and unfortunate turns. We'll talk about them, tell stories--funny and otherwise--we may have told before. But underneath it all is something strangely and poignantly wistful that is easier to experience than to explain. A tear or two may flow, but laughter will carry the day. To borrow a title from my favorite song of those cherished Bradford years, "It's All in the Game." We'll reminisce about the sweet used-to-be, a time when you could get on a plane without getting undressed, when mosquitoes were occasional nuisances instead of winged assassins, and a Christmas gift might be one of those wildly irresponsible vintage toys of our youth--the chemistry set--the better to conduct home experiments with the ammonium nitrate now prized by rogue terrorists. Our first cars are quaint relics now (it's cringe-inducing to contemplate how crude and dangerous they really were), but how treasured they were then! Apples were something we ate; Steve Jobs was just 6 years old on our Graduation Day and hadn't decided to change the world just yet. Amazon was a river in South America, a tweet was a sound produced by a bird, and Google was the name of a comic-strip character whose first name, if you don't remember it, can be learned if you use his last name to find it, using a device probably within arm's reach. Culturally, a maverick from Mississippi named Elvis Presley was viewed as outrageous by some as the fabled Generation Gap reared its head, writ large. No one envisioned such outre performers as Alice Cooper, Madonna and Sid Vicious and others of inexplicable popularity. Thus, rap and hip-hop aren't likely to be heard at the Chateau on our special night; Snoop Dogg won't be making the playlist. We'll hear many oldies and savor the memories they conjure up as the sound track of our youth plays on. Our graduates include at least two doctors that I know of, perhaps a lawyer or three, but most likely no Indian chiefs. Scanning the yearbook, some wonderful names pop out--a Jane Eyre and a Thomas Wolfe, whom I dearly hope can come home again. The Annex may be gone but still stands tall in our memories. It rained on our scheduled Graduation Day, a happenstance that turned out to be more of a innocuous oddity than an ill omen. Those of us who have moved away can use this occasion to revisit old haunts (the ones that still exist) and scan the crowd for familiar faces (thank God for name tags) and lament the absence of those we fear we may never see again, trying to remember that, as a poet once said, people die but love doesn't have to. The list of Missing Classmates numbers about 280 and leads one to wonder where those people are, and, if still living, why they have stayed in the shadows. If by choice, we have to respect that; if for darker reasons, that's most unfortunate. We may know the circumstances for a few, but for the others--whether they were good friends, casual acquaintances or names we hardly recognize--like a lot of life's mysteries, we may never know. We can only hope that life has dealt them the best possible hand. It has been said that the 25th is the best reunion--some liken it to life's mid-term exam--and say they only get sadder after that. But most marathoners--those lucky enough to remain in the race--feel more exhilaration in the home stretch than they did at the halfway mark. Granted, we know the trip is not going to last forever, but it's satisfying to toast the milestones we've achieved and humbly acknowledge our good fortune. And who knows--the way research is advancing on the scourges of cancer and Alzheimer's, in five years 78 may be the new 61. Let's drink to that!